I’ve moved the site away from the ancient and wheezy Movable Type over to WordPress. Most things have been preserved except the galleries which I’m going to leave up at Flickr from now on. Sorry if this breaks anything but URLs aren’t forever! FriendFeed is hard to explain – it’s like a cross between a forum. twitter and facebook. But it’s better than that: FriendFeed draws in all your content from all the other places you hang out including Twitter, Facebook, YouTube, your own blog (via RSS) and presents it in one place. People can then comment on those posts and you can follow other people’s content. I admit that it has a bit of a geeky leaning (mostly IT losers like myself and photographers) but the cool thing is that you can get to see content the friends-of-friends like too, exposing you to whole new range of people. It’s fun! Do you share stuff (links, notes) on Facebook? FF is a damn easier to do that with (they have a funky sharing bookmark tool). Oh and that commenting / liking thing Facebook has? Where do you think they nicked it from. There’s even a FF app for Facebook so you can share your FF stream with FB. Not only is the FF / Twitter integration instant, but FF makes a much better Twitter client. FF is also real time, so you see posts scrolling past as they happen. FF also unpicks shortened URLs and embeds twtitpics automatically so you see it all in one place. FF can also “Tweetcast” your FF posts/comments/likes so you can still reach out to your Twitter followers. I know reader has some social networking features, but they’re pretty late to the party. Why not post your reading matter into FF for all to see rather than have people guess at obfuscated URLs? Now that reader and FF use PubSubHubbub, your shares and likes in reader show up instantly in FF. You don’t even need to create an account if you use Twitter, Facebook or Google – just sign in with the account you already have. What’s to lose?! Lastly, I’ve found the team behind FriendFeed to be the most receptive and responsive bunch of developers I’ve ever come across. New features come out regularly (like groups and friend lists recently). There’s a neat new API for people who like to tinker (my mini blog on the left there is driven using the v1 API). 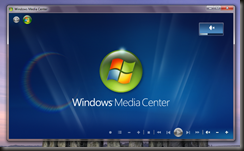 I did an in-place upgrade of our living room media centre to the Windows 7 RC last weekend. I was a bit hesitant, not least because it’s our main TV and therefore has to have a high wife-acceptance-factor (WAF>90). I had updated to Vista TV Pack a few weeks ago and found some issues with reception of a few channels (C4 mostly) so I felt that things probably couldn’t be any worse. The upgrade went amazingly smoothly and things pretty much "just worked". I had to update my network card drivers as they blue screened on standby, but they were 2 years old. The iMon LCD display also doesn’t work as their app crashes on startup. I presume an updated version will emerge sooner or later. – If you hadn’t already gone to Vista TV Pack, then you’ll get interactive ("red button") on DVB-T and subtitles. – Speaking of subs, when you mute media centre, subs get turned on automatically. Neat. – TV quality looks better, a bit sharper perhaps. – I love the new screensaver of your favourite pics / cover art when TV is paused or stopped. – In the guide, hold down the arrow keys and you’ll super-speed through the days. – The now/next mini guide is much improved for browsing around channels. – The new movies section automatically categorises and grabs cover art for any movies you record from TV or play back via DVD. The only thing I don’t like is the media centre startup noise. It sounds like Fox News’ jingle or some American anthem. At least you don’t have to hear it that often. I’ve just finished building a media centre PC. I’ve wanted to be able to do timeshifting and simultaneous recording of TV for a while and the added benefit of using a Vista box to do this is that I can play all my music and HD content too. It’s not quite the ultra silent PC I was after, but it’s not too bad. The only noise is a small bit of CPU fan noise. At the moment it doesn’t fit into my AV cabinet under the TV (the case is pretty big.) but if I get another one in the future then that should really help cut down on the audible noise. Using the fabulous ping.fm? Want to use your own Custom URL? Want to use Perl? Use this! The attached script takes only status updates from ping.fm and writes it out to a file. In my case, this file is then "included" by apache dynamically on the front page of my site.